Our Cloud Nine Sheepskin brand has been around the world and around the block more than a few times. We know what makes a great shoe – and our thousands of customers can attest to that fact. We’ve tested and tweaked out styles and we measure up against any sheepskin footwear anywhere. 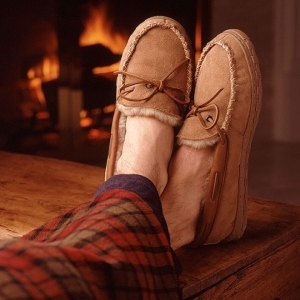 Our full line of sheepskin footwear, pelts and accessories prove that when you step onto Cloud Nine, you’re in heaven. Sheepskin is pound for pound, stronger than steel… it lasts for years with minimal care and there’s no synthetic material that comes close. Sheepskin against the body gets the blood circulation and the immune system going to keep you feeling and performing better. And at sheepskin.com, that’s what we specialize in and have done so for over a decade. We have real sheepskin shoes and boots for men, women and children. We have pelts, seat belt covers and accessories to pamper your senses and cushion you from the bumps and chills of a tough modern world. Peruse our pages… and envelop yourself in warmth and softness and experience what’s been kept a secret for, yes, thousands of years. Rediscover the real thing. Cloud Nine Sheepskin at sheepskin.com.